Hurricane Matthew has been one of the strongest in quite some time and violently struck the south of Haiti on 4 October this year. The scale of the impact has continued to increase as a result. Matthew has left a trail of devastation in its wake, particularly in southern regions, La Grande Anse and Nippes areas. Some towns in western, south-eastern and north-western regions have also been affected. It is estimated that over 60 towns and a resulting 250 or so urban areas have been severely damaged. Since the 4th of October, our teams in Haiti have been trying to coordinate with all our partners (farmers’ organisations and NGOs) in the regions affected by the hurricane. We know that the north of the country and consequently, the FECCANO cocoa producers’ cooperatives, didn't suffer any damage. 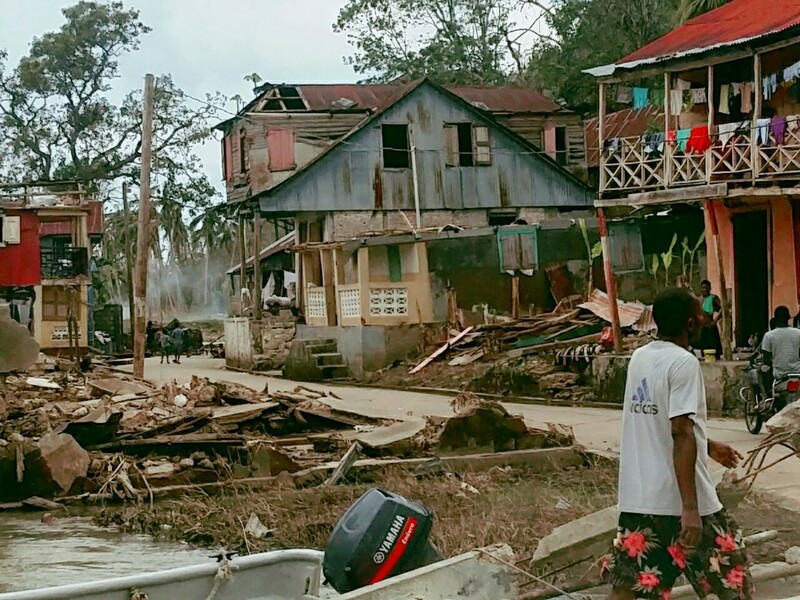 In the Grande Anse area, cocoa farmer cooperatives along with AVSF partners in Dame-Marie, Anse d’Ainault and Les Irois were wiped out by the cyclone and completely flooded. They undoubtedly fell victim to the brunt of the destruction. The road between Les Cayes and Jérémie, the capital of La Grande Anse, has just now been unblocked. Up until now communication has been difficult and telephone networks are oftentimes overloaded. The two co-ops we managed to contact have said that cocoa plantations have suffered severe damage and that all the cocoa beans have been snapped from the trees and are now laying on the ground. Some fermentation and storage buildings have been damaged, roofs ripped off, walls torn down and consequently, fermentation tanks destroyed. The trees now need to be checked to see if they still are intact and if so, only the “small harvest” will have been affected by the hurricane. Given the strength of hurricane Matthew, asides human lives lost, the agricultural destruction on La Grande Anse is vast. This irrefutable loss boils down mainly to livestock, crop fields, and orchards with cocoa, coffee, banana and other fruit trees. Other towns in the south and south-east have also been affected by the hurricane. AVSF has visited these areas with its partners including farmers’ organisations and coffee cooperatives. 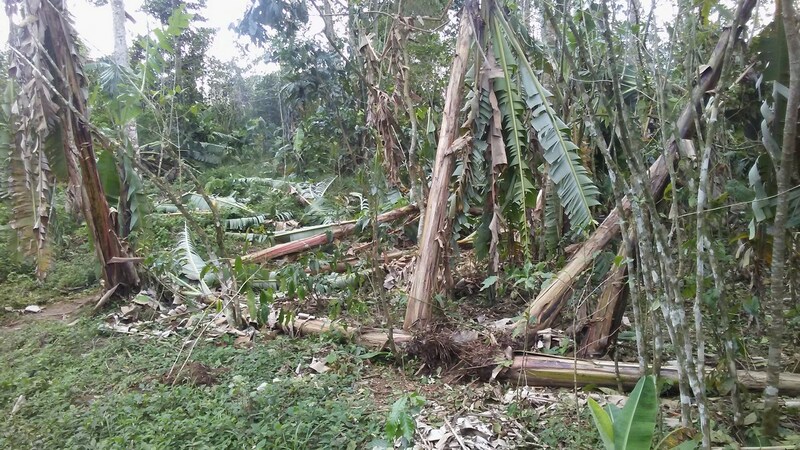 Our teams in Baptiste in the central uplands have reported coffee farmer plantations wiped out by the wind and rain, despite being far from the coastline. AVSF has been cooperating with the social movement CROSE and the FODPM farmers’ association in Michineau, a town on the mountainous coastline of Cayes-Jacmel, for many years. While farmers’ homes here withstood the hurricane, field crops such as beans, corn, bananas and peas have been badly hit with an estimated loss of at least 60-70%. 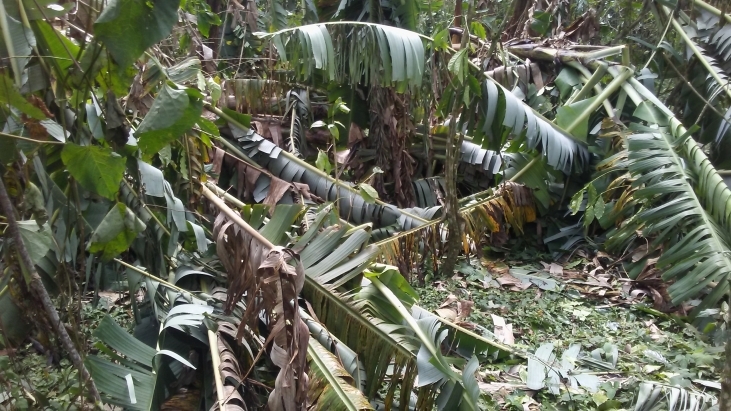 80-90% of the banana trees have fallen down in the worst-affected plantations. Only tubers such as ginger and sweet potatoes seem to have survived in these areas. Farmers in Michineau who were waiting on the October and November crops to prepare for the big harvest season in February are now in an extremely vulnerable situation while the children are going back to school. A similar situation has been reported in Côtes-de-Fer where we are supporting farmer organisation initiatives with our partner CROSE. Here, orchards have been destroyed, hundreds of animals including goats, pigs, donkeys and cattle have died, over 120 houses have been destroyed, and more than 700 damaged. 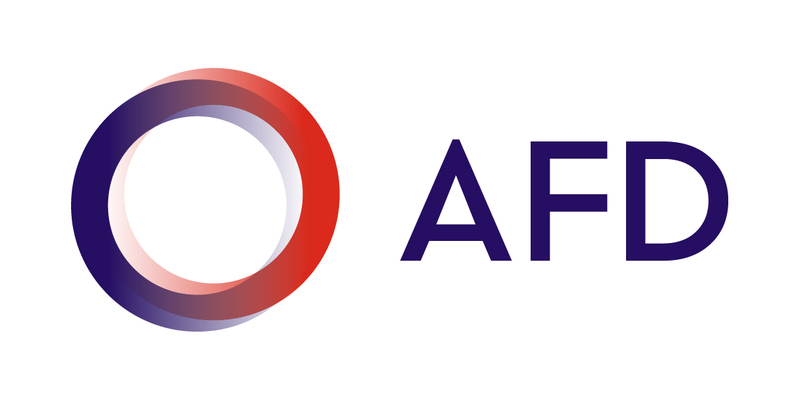 ANATRAF is the national association for fruit processing. They work with around 50 small rural businesses that process and sell fruit and other goods such as sugar etc. ANATRAF has a workshop in the town of Vallue which has been subject to major destruction. A Haitian colleague stated that: “Crops in the orchards have been wiped out, the leaves ripped from the trees now form a green carpet on the surrounding ground, the wind has lifted off corrugated tin and metal roof structures and flung them into random places in the orchards, demonstrating the level of violence and destructive power (...) I’ve felt the suffering, pain and concern from the people I’ve met, who are without doubt all part of an entire community and yet, haven't shed a tear and are already working on saving their damaged homes.” There are many immediate needs which fall first and foremost under the jurisdiction of national emergency aid services, alongside international organisations and humanitarian aid NGOs: health, water supply, temporary shelters, essential goods and equipment, housing clean-up, and school kits. The next, post-urgent phase should start very soon. Needs here will include reconstruction materials also (corrugated tin, nails, boards, blocks), clearing drains, repairing or rebuilding agricultural processing and storage buildings, distributing farming and fishing kits, cleaning up destroyed orchards and fields, replenishing agroforestry land (fruit, cocoa trees...), particularly with short cycle varieties, and lastly, the essential replacement of lost livestock. 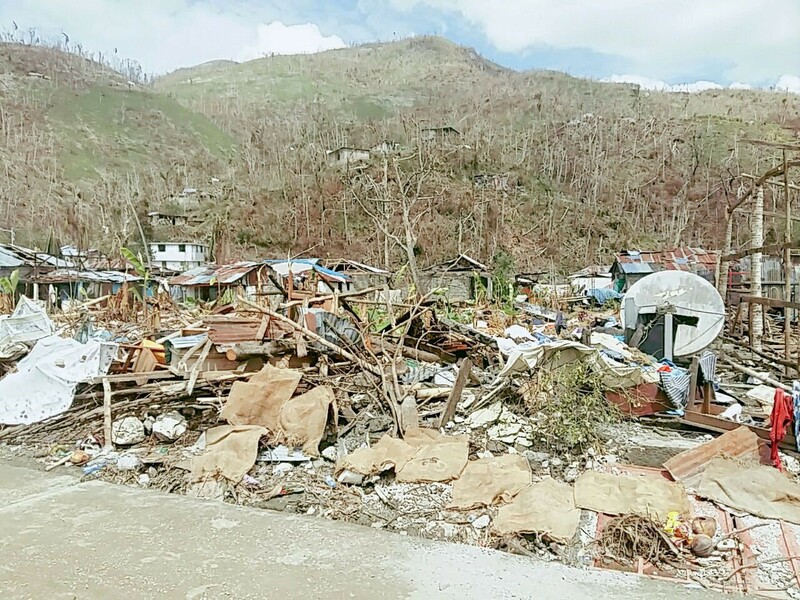 In a desire to help the people and partner organisations who have fallen victim to the destruction during this post-urgent and recovery phase, AVSF and its teams are providing their Haitian partners with a detailed damage report. A joint mission between Fondation de France and AVSF should also be set up by the end of the week in the south and in La Grande Anse. We will decide upon what aid we can provide onsite depending on the direct needs of the affected people and organisations, the means we have within active projects, and our financial partners. This will be in an aim to restore production methods and restart farming systems, in direct support of farmers’ organisations and Haitian NGOs. For successful aid coordination, we are spreading the support campaign launched by Fondation de France, AVSF’s reconstruction partner following the terrible earthquake that hit the island in 2010. 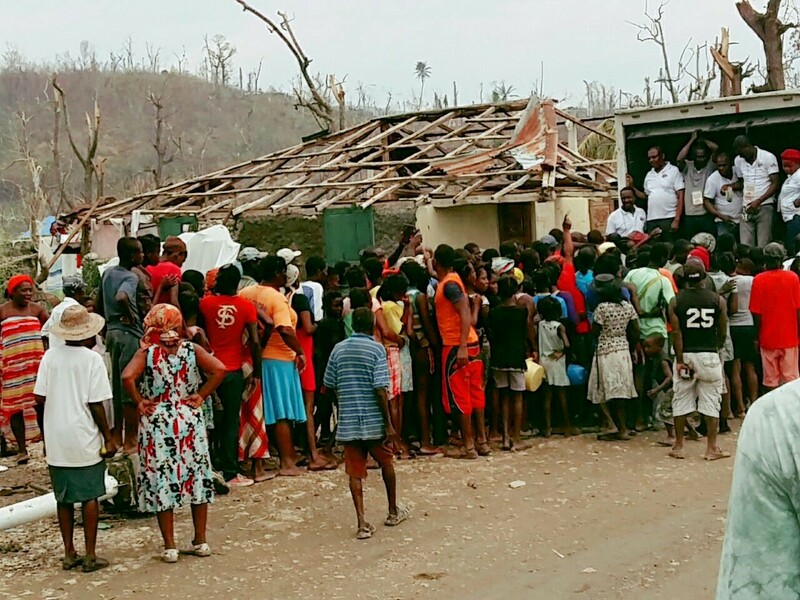 If you wish to make a donation on our website , you can also support our restoration projects in rural areas (by indicating “Hurricane Haiti” in the message part of section 3).